YouTube subscriber Chase P. asks: Do a video on why humans have allergies. It’s that time of year when tissue companies nationwide rejoice at the excessive mucus caused by allergies. If you’re one of the unlucky, you might ask yourself why we get them anyway? 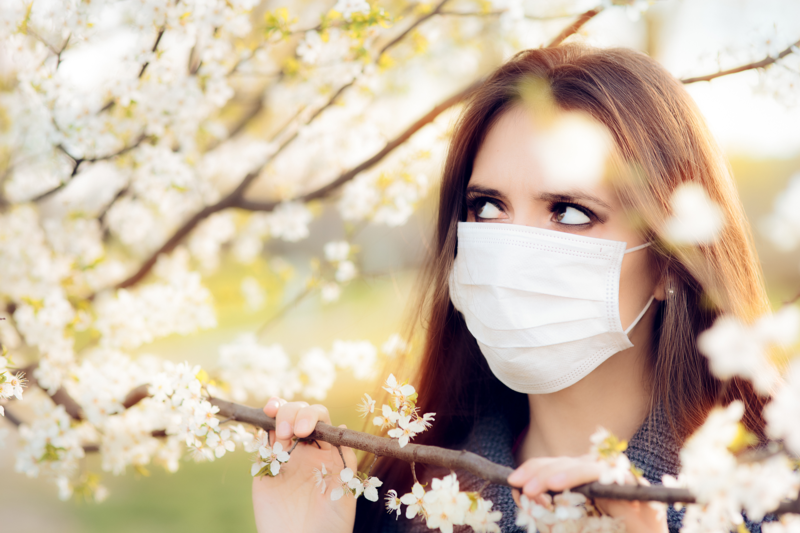 Why would our immune systems react to seemingly harmless things like pollens, dust mites, and the dander from cats and dogs? There are two proposed theories here; the most widely accepted involves an evolutionary mechanism for expelling parasitic worms, a frequent problem for our ancestors before the advent of modern medicine and potentially living in a more hygienic environment. A relatively newly suggested competing theory is that the reaction is due to how the immune system responds to a type of cell, known as a mast cell, when it releases its chemicals of inflammation. Before we can understand the two theories, it’s important to know how the immune system works in general when it encounters a potential allergen. There are two ways it can deal with a foreign pathogen- either kill it (type 1 reaction) or attempt to expel it from the body (type 2 reaction). Should you have a large pathogen, like say a parasitic worm, the body would generally illicit the type 2, expulsion tactic. A smaller microbe, like a bacteria or virus, will generally trigger the type 1 response. All the cells of your immune system revolve around a class of cells called white blood cells. One type of white blood cell is a B cell. B cells have antibodies on their surface; known as Immunoglobulins (Ig), they are Y shaped proteins. When an allergen contacts your skin, eye, nasal passage, mouth, airway, or in your digestive tract, it will attach to the antibody on the B cell. The B cell will then become activated. Once activated, they will begin to multiply. Some turn into memory B cells that will recognize the same molecule later in life and be able to more quickly mount a defense. Some turn into plasma B cells (effector cells). These make more identical antibodies that attach to the molecule its predecessor just recognized. They’re so good at it that one effector cell can produce about 2000 identical antibodies per second! Those antibodies will then attach to the invader and mark it for recognition by other white blood cells that will destroy the suspicious molecule. They do this by attaching themselves in a process called opsonization. Different allergens will end up producing different antibodies. In 1967, two research groups from Colorado and Sweden identified a new type of Ig, known as IgE. This little antibody proved to be the main force starting a cascade of events that leads to those sinister allergy symptoms. More recently, scientist have been able to genetically engineer mice to stop making IgE. Those mice don’t get allergies. Science! In any event, once produced, IgE begins circulating around and attaches to the receptors (Fc type I and II) on the previously mentioned mast cell. These cells are responsible for most of the processes involved in the symptoms you feel when suffering from allergies. When stimulated, they begin secreting a barrage of chemicals, called degranulation. One example is the release of histamine. Histamine is important for several of our allergic reaction symptoms- things like the constriction of your bronchioles, the dilation of your arteries, the perception of itching, and the production of hives. It’s also responsible for many of the processes involved with inflammation. So to sum up on the how, or at least as it’s generally understood (there is some controversy here as we’ll get into in a moment) an allergen enters the body, attaches to B cells; IgE is created and stimulates mast cell degranulation; inflammation ensues and all the symptoms you feel begin causing their web of woe. The immune system stays activated until it senses no more allergen to attack, and you’re now you’re back to normal! With the “how” covered, this bring us back to the question of why we get allergies to things that are seemingly harmless? No one has definitively answered the question, but everyone seems to agree that IgE is the main antibody responsible for all the immune system reactions and the inflammation it brings. So, what in natural selection made IgE an important trait required for our ancestor’s survival given today some consider it mostly useless, and more than a little annoying for those with allergies? Until recently, the leading theory revolved around parasitic worms. In 1964, scientist Bridget Ogilvie showed that IgE was found to be in abundance in rats infected with worms. Our ancestors also had a problem with worms. They didn’t have access to modern medicine and hygienic environments that have reduced the infection rate down to the current 20% worldwide (with most that are infected residing in underdeveloped countries). Throughout much of history, everything from roundworms, such as hook-worms, to flatworms, like tapeworms and liver flukes, were relatively common. IgE and the symptoms it creates, like sneezing coughing and diarrhea, all serve to expel those nasty little freeloaders. As Dr. David Dunne from the university of Cambridge states, “You’ve got about an hour to react very dramatically in order to reduce the chance of these parasites surviving… Allergy is just an unfortunate side-effect of defense against parasitic worms.” So IgE’s ability to kick things into high gear to quickly react to such an invader would seemingly be very handy here. What do parasitic worms have to do with allergies? The idea here is that the reason we get such a strong reaction to certain other less threatening things that our immune system might be much better off ignoring is that the proteins on the surface of parasitic worms are similar to the molecules we encounter in other aspects of our lives. The B cells responsible for the immediate immune system response react to a non-specific class of molecules. Thus, our immune system will respond to allergens that are structurally similar to the proteins found on the surface of worms. The body then attempts to rid itself of them, whether they’re harmful or not. The left-over response from our immune system reacting to worms (and now similar protein molecules) is why allergies continue to torment landscapers everywhere, or at least as far as this theory goes. While a long-standing theory and very widely accepted in the medical world, the defense against worm’s philosophy gets somewhat undermined when you look at studies showing IgE isn’t actually strictly necessary to fight them off. The mice scientists have genetically engineered to be unable to produce IgE are still able to rid themselves of the parasites. That’s not to mention the fact that people can have these types of allergic reactions to things that have no possible biological link to any protein found on a worm, such as reacting to the metal nickle. So even if this is a factor in why we have allergic responses to seemingly otherwise harmless things, it can’t tell the whole story. This brings us to the slightly newer theory as to why we have allergies. It also involves the idea of our bodies attempting to expel allergens, but instead of the immune system recognizing a structurally similar protein molecule to that on parasitic worms and misinterpreting that the body has acquired such a parasite, it is the immune system reacting to actual damage caused by that invader- namely, the destruction of those mast cells. When mast cells begins to degranulate, the body begins making antibodies to several of the proteins around the area affected to try to get rid of whatever foreign agent. Should it inadvertently make an antibody to, for instance, the proteins found on peanuts, you will then get memory B cells to fight against peanut molecules in future. Congratulations, you now potentially have a peanut allergy. Dr. Ruslan Medzhitov, professor of Immunobiology at Yale University School of Medicine (and arguably the biggest promoter of this theory), likes to think of it like how we protect our homes. If you’re not home and someone breaks into your house, your alarm system won’t go off based on recognizing the intruder’s face, but by the fact that they broke a window. So in a nutshell, it’s not recognizing the molecule, but rather simply creating antibodies for things around mast cells degranulating. In support of this theory, Dr. Medzhitov and co. began investigating potential cell damage caused by various allergens. For instance, when they injected mice with an allergen found in honey-bee venom, PLA2, they found that their immune systems did not initially respond at all to the PLA2 itself. It wasn’t until the PLA2 ripped open cell membranes that the immune system kicked into gear producing IgE as a rapid response mechanism. And, as previously mentioned, other pathogens in the area might potentially get implicated as the “house burglar,” with your immune system creating the memory B cells to react to it later. Fascinatingly, no matter which side of the why-we-get-allergies debate you’re on (or even if you think both ideas are partially correct or both incorrect), one thing almost all researchers agree on is that allergy rates are increasing. For instance, nearly 30% of adults and 40% of children in the US are affected by some sort of allergy. Why? We’ve known for a long time that both genetics and the environment play a part in getting allergies. Technology has also allowed us to create countless never-before-seen synthetic chemicals. Their associated molecules could potentially trigger any number of reactions by the immune system that our ancestors didn’t have to worry about, perhaps being one factor in the increased allergy rates. Another potential factor is something known as the hygiene hypothesis. Many scientists believe that with the promotion of good hygiene taught throughout the industrialized world, which most definitely does have an amazing number of significant benefits, there may also be a downside in that children aren’t being exposed to as many pathogens that their immune systems can learn to respond to correctly, or some even postulate potentially need to respond to develop the immune system properly. The idea in the latter case is that for most of human evolution, the immune system developed being exposed to these pathogens as a matter of course, and, similar to how we’ve evolved to need many types of microbes in the digestive system to survive, the idea goes that the human immune system perhaps has evolved to need to be exposed to certain things in order that it later correctly responds to introduced pathogens, rather than triggering an allergic response to things it might be better off ignoring. Thus the immune system later in life overreacts to some things, or sometimes even reacts to parts of the body itself. Potential supporting evidence put forth in support of this idea is the similar massive rise in not only allergy rates, but of various auto-immune diseases. In both cases, there hasn’t been a corresponding rise in allergy and auto-immune disease rates in individuals from underdeveloped countries who get exposed to various pathogens more similar to our ancestors throughout history. As is now presumably abundantly clear, no matter how we get allergies, the why is unfortunately still the topic of hot debate with little in the way of concrete answers currently available. But whether you subscribe to the “recognition” worm theory or the “alarm system” protecting your house theory, rest assured that IgE, once thought to be mostly useless outside of its aid in expelling parasitic worms but now thought by some to play a significant beneficial role in early recognition and reaction to various pathogens, is the molecule responsible for all the madness. If you’re like me, what you really want to know is how to stop the allergic response before blowing through every Kleenex in the house- the current treatments revolve around the severity of your specific symptoms. If it’s milder, and you tend to only get a stuffy nose, watery eyes, and sneezes, you might simply take a decongestant like Afrin or Sudafed. Antihistamines like Benadryl, Allegra, and Zyrtec will also help with the hives, itchiness and some inflammation. Corticosteroids like prednisone and solu-medrol are sometimes also prescribed to help reduce inflammation. Should your body react more systemically, and cause a life-threatening situation like anaphylaxis, Epinephrine, carried by so many in the form of an epi-pen, is your best choice. Any combination of these, or specific allergy treatments like mast-cell inhibitors, are very commonly used. Every time the dust gets kicked up in my town I can end up sneezing about 40 times in a row. The sneezing feels good though, the puffy eyes and runny and itchy nose I get if I’m outside sure as heck don’t. Cutting grass is a nightmare because of this. It only happens a couple of times a year so my doc told me not to worry about it. It’s like I end up reaching my sneezing quota for the year in a matter of minutes.